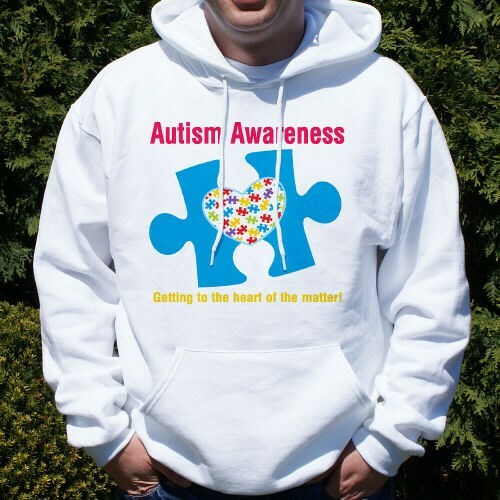 Spread awareness anyway you can by wearing this Autism awareness hoodie. Our Autism awareness clothing is great for showing your support at any awareness event hosted in your community. The great design features bright colors for joy & optimism and the puzzle piece illustrates the complexity of this condition that has changed the lives of many. Each awareness hoodie for Autism is available on our 50/50 cotton/poly hooded sweatshirt, machine washable in sizes youth S-L & adult S-3XL. Additional Info Help make a difference with Autism Awareness Apparel & Walk Gear, from MyWalkGear.com. We are here to outfit you and your team with unique and eye catching awareness gear so you can help spread awareness anyway you choose. When joining your community walk event, you and your fellow team members will stand out with a Autism Awareness Hoodie like this and be sure to also bring along our Autism Awareness Dog Tag & our Personalized Autism Can Koozie as well.